Ella Hunt is Anna in Anna and the Apocalypse. Sure, this holiday season will bring Aquamen, Bumblebees, and flying nannies. But only one movie will have singing, zombies, and high school kids, all set at Christmas. That movie is Anna and the Apocalypse—and finally, after over a year of waiting for the movie’s release, you can now see one of its musical numbers in full. The film, which opens November 30, debuted at Fantastic Fest last year, where I said “it’s so much fun, it could even go a long way to turning musical fans onto horror, or horror fans onto musicals. It has that kind of universal appeal.” Strong words, but I think this clip finally backs that up a bit. The song is called “Hollywood Ending,” and while there’s neither violence nor zombies in this particular song, as it’s from early in the film, just imagine catchy tunes like this throughout, coupled with zombie gore, and you begin to imagine how magical this movie can be. Oh, and in the movie, the lyrics aren’t on screen. That’s just for this video. That energy, angst, and humor permeates the movie, especially as the whole zombie apocalypse thing happens around these characters. 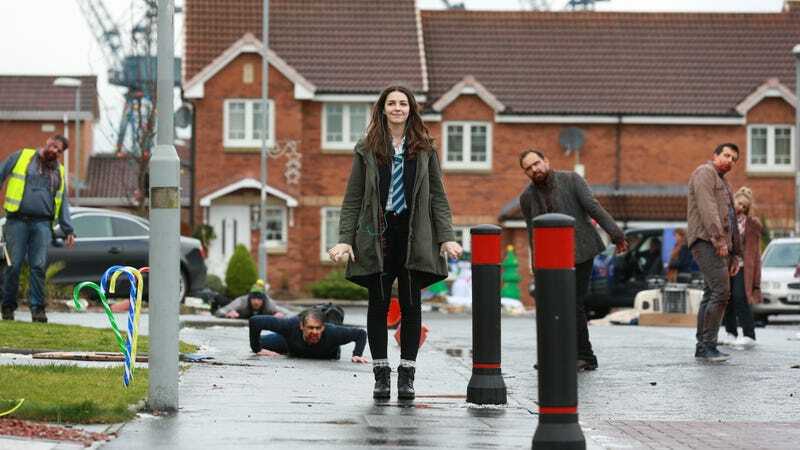 So if you enjoyed even an iota of that, odds are you are going to enjoy Anna and the Apocalypse when it hits theaters November 30. Find out much more about Anna and the Apocalypse at its official site.